SEVEN, a product of Envato Elite Author, is a fresh portfolio concept for creative freelancers or agencies to help build portfolios that are enjoyable and distinctly unique. It has absolute modern easy to work with features like drag and drop page builder, WPML compatibility for multiple languages, video tutorials for swift integration, ultra-responsive on all screens and devices. 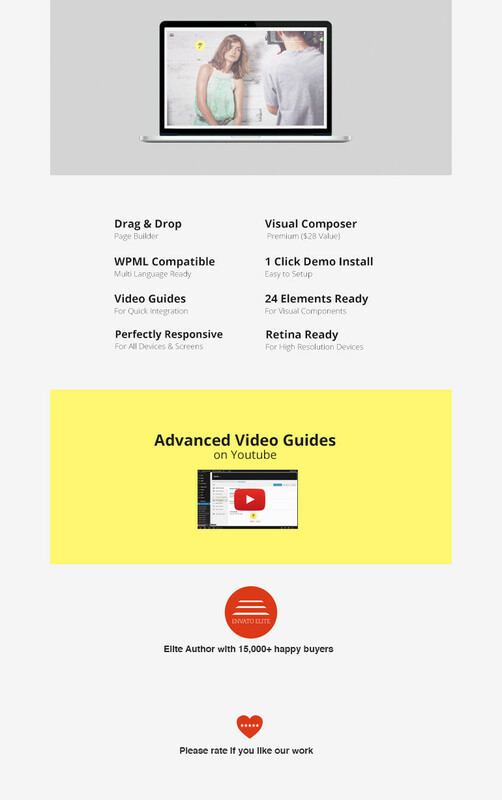 premium visual composer, retina ready for high resolution, twenty four elements ready for visual components, easy installation set up guide. easily accessible support system which allows photographers, bloggers, online shop portals and other freelancers to display their work without much hassle.